We took a break from harvesting silage last week to catch up on some other jobs around the dairy farm. Although Monday was pretty much a washout thanks to Tropical Storm Lee and its nearly 7" of rain (much needed, by the way), we did fit in a lot of work Tuesday through Friday. We spent some time moving several animals around into other pastures, fertilized a couple of fields with slurry, and performed maintenance on our harvesting equipment. The best thing about the past week is the upswing in our cows' milk production. On average, the cows are producing five pound of milk more than they were at the beginning of last week. Cooler nights, not-quite-as-hot days, and a change in their feed formulation are the primary reasons the cows are doing better. 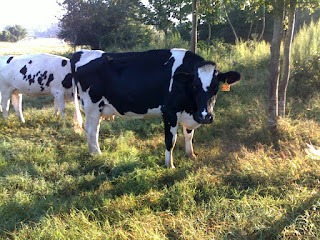 We are also benefiting from having more "fresh" cows in the milking herd. A fresh cow is one that has recently calved and is increasing its milk production. We resumed our harvest yesterday with 90 acres of forage sorghum ready to be chopped. If all goes well (and it rarely does with our chopper), I would hope we could harvest 10 acres per day. I managed 5 acres Monday afternoon, so we shall see. Unlike our corn which was planted mostly in straight rows on flat land, all of our sorghum was planted in contoured, terraced fields. This means that we'll have to run a little slower and will have more in-field turning. These fields are closer to our silage pits, though, so there should be minimal downtime waiting on the dump truck to travel back and forth. Remember, you can keep up to date with what's happening by "liking" our Facebook page or by following me on Twitter!